Earlier this month, I was privileged to co-lead an Institute for Field Ornithology workshop with Ted Floyd in the San Louis Valley of south-central Colorado. 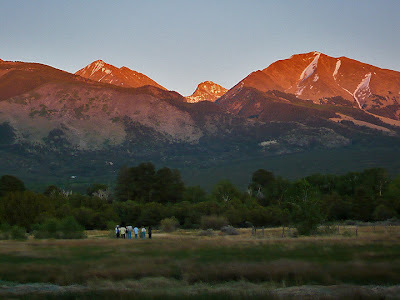 Our base of operations was the Medano-Zapata Ranch, a huge (~100,000 acre) preserve owned by The Nature Conservancy near Great Sand Dunes National Park. 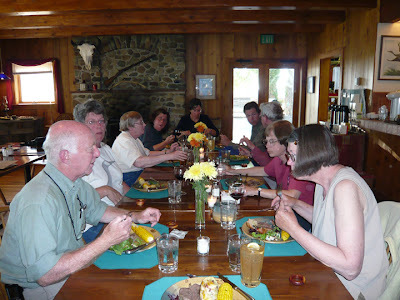 The ranch was fabulous, with a rustic-plush atmosphere, incredible views of the Great Sand Dunes & Sangre de Cristo Mountains, and fantastic birding on the grounds. The procession of meals was amazing, often featuring bison from the ranch, and there was always a deluxe line-up of snacks and beverages available in the dining room. Needless to say, if you get the chance to visit, I'd say to jump at the opportunity!! 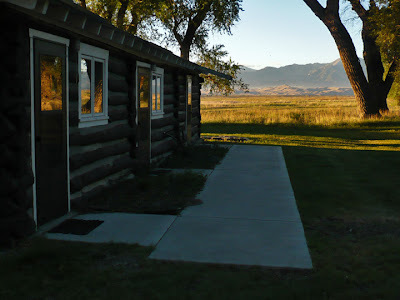 My cabin, with the Great Sand Dunes to the north. 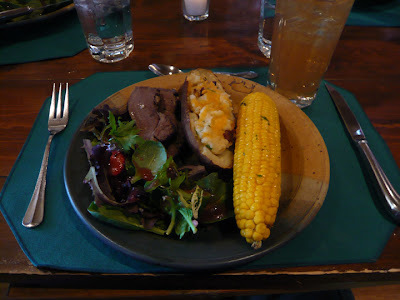 A typical dinner, this one with roast bison, spring greens, grilled corn, and a stuffed potato. As amazing as the ranch was, it was only our home base. 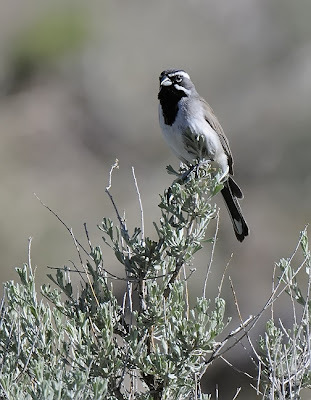 Each day we set out to visit various habitats around the San Louis Valley (which is as big as the state of Connecticut), accumulating a highlight reel of valley specialty birds like Gunnison Sage Grouse, Snowy Plover, Chihuahuan Raven, and both Black-throated & Sage Sparrows. 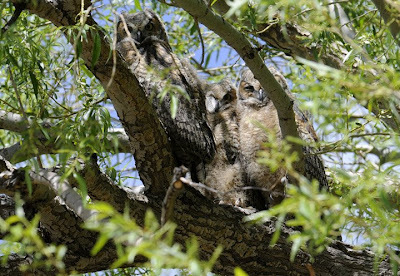 Then we would return to the ranch to clean up, eat some more, and have lectures and discussions before conking out for the night (unless it was an owling night...) We ended up with 136 species for the workshop, most studied well in the context of their habitats. 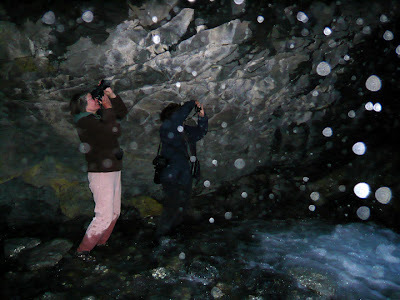 This study presents 11 years of nesting success and phenology data for Black Swifts (Cypseloides niger) at Box Canyon in Ouray, Colorado. 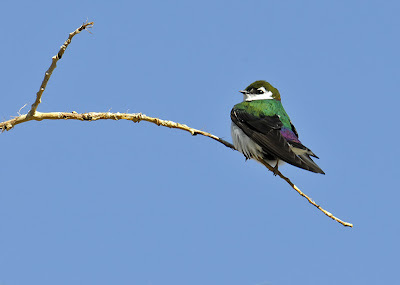 Nest data were recorded on a near-daily basis for 160 nest attempts. 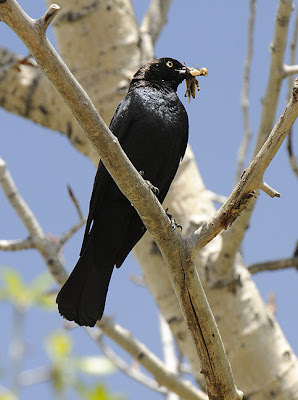 Nesting success was 72% and mean and extreme dates of nesting events, including arrival, egg-laying, onset of incubation, hatching, and ﬂedging are reported. On average, Black Swifts arrived on 13 June, egg laying started on 28 June, incubation started on 1 July, hatching occurred on 26 July, and ﬂedging occurred on 13 September. The average incubation period was 26 days and the nestling phase was 48 days. In seven instances, a second egg appeared after loss of the ﬁrst egg and, in one case, a third egg appeared. It was not possible to ascertain whether second or third eggs represented a renesting attempt or nest usurpation. We were at the final approach to the falls as the sky was lightening when I spotted the first silhouetted darts streaking away from the mountain. 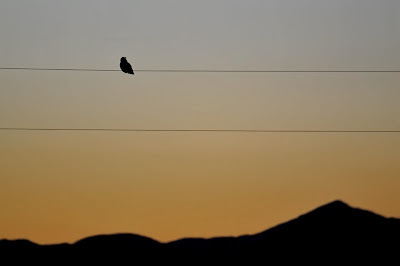 As the sky brightened, more and more of the birds appeared, sometimes effortlessly blasting out beyond view over the valley out and other times circling above the outflow of Zapata Creek. At one point we had 26 of the birds gathered in a vocal whirling cyclone of inky speed, but as the sky brightened the crowd thinned out. By the time daylight reached us the swifts were gone, likely high above the Sangres gathering pelagic insects above the tundra. 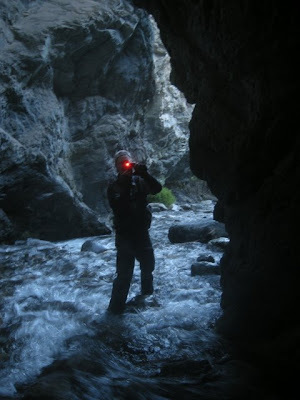 A few of us decided to see what the nesting site of the swifts was like, sacrificing dry boots to wade up the tumbling creek inside of a gorge cut by the falls. 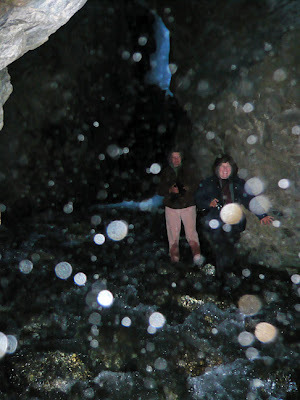 Around a final corner was the falls, plunging in an arc about 30 feet down and filling the air with mist. A big block of ice still clung to the wall across from the falls, a relict of the winter's build-up. I was far from warm, even in my layers of synthetic clothes, and I was only there for a few minutes. I can't imagine a chick weighing only a few grams sitting unprotected and unmoving for hours every day, bathed in the mist and never feeling the warmth of the sun until its first flight, but that is exactly what they do! 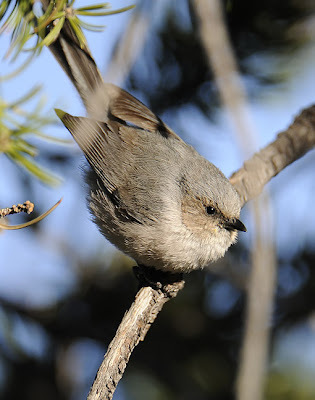 These birds arrive in the state late (on average, 13 June at the Ouray study site) and depart early (average fledging on 13 September in Ouray.) 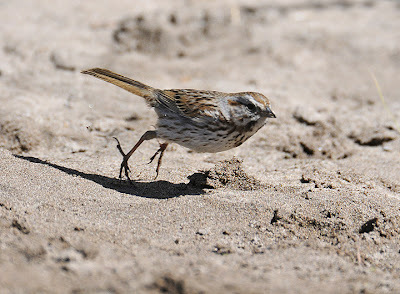 In the intervening 9 months there is almost no certain knowledge of where these birds go or what they do- presumably, they migrate (perhaps non-stop) to somewhere in South America, although their route is unknown and their wintering sites remain undiscovered. Definitely these are high on my list of favorite birds, and I will always consider sharing time with Black Swifts to be a privilege and a highlight of my birding experiences. Damp and chilly but smiling as we depart the mist-filled gorge!! 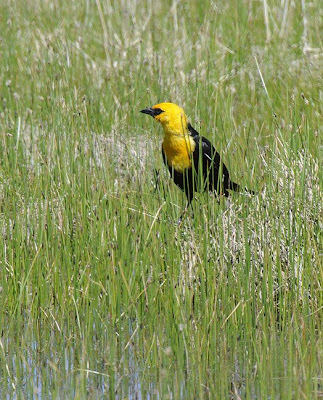 In my previous post I mentioned Ted Floyd's new book, the Smithsonian Field Guide to the Birds of North America, and linked to a bunch of bloggers who have reviewed it. 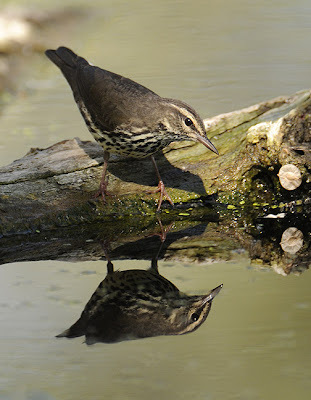 To follow up, here's Ted himself talking about his approach to birding, aspects of the book and included DVD, acquiring the ~2000 pictures for the book, and other insights into what went into this major project. It is broken into two parts, embedded below. Enjoy! You may have noticed a widget on the left of my blog promoting Ted Floyd's new book, Smithsonian Field Guide to the Birds of North America. The book has been out for about three weeks now, and people are starting to chat it up in blog-land. I like it a lot and think it deserves a place in any American birder's library or knapsack, but I have a significant bias- it features a bunch of my photos! So I'll let some other reviewers do the talking- check 'em out. UPDATE: Thanks to Noflickster for pointing out another blog review, this one on Conservation Conversations. I've added that link to the bottom of the list- if you know of any other bloggers reviwing this book, let me know and I'll add theirs, too.